Get fast-acting relief for dry hair with this floral-scented essential oil – a delicately sweet blend of dainty floral and honey scents. 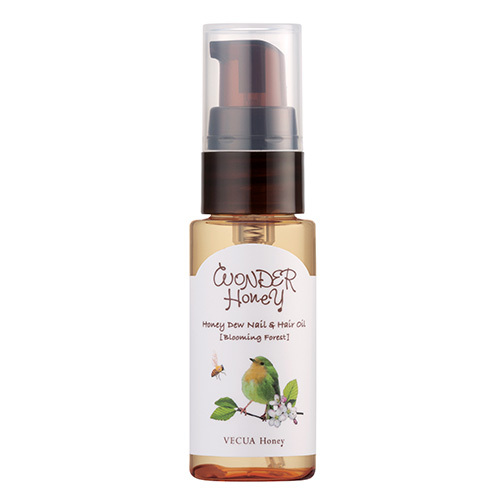 Wonder Honey Honey Dew Nail and Hair Oil (Blooming Forest) targets areas particularly susceptible to dryness and damage. The non-sticky oil formula delivers moisture and leave hair soft and silky smooth. Perfect for those who struggle with hair split end, and those who suffer from nail and fingertip damage. The portable size is convenient to carry around. Made with a carefully selected blend of natural oils, vitamins and honey. This is a light floral champagne scent infused with lemon and green apple. Let the vibrant freshness of flowers whisk you away. HOW TO USE: Place one pump of product on the palm and massage gently on hair’s damaged split ends, and also on the fingertips. Chamomile flower oil: Helps target rough skin, dry skin, and breakouts. Scent has calming effect. Geranium oil: Restores balance to natural skin oils. Scent soothes irritated mood. Mineral oil, Vitamin A and E, Honey. Be the first to review “Wonder Honey Honey Dew Nail and Hair Oil – Blooming Forest” Click here to cancel reply. <!--Vecua Honey © 2013. All Rights Reserved.